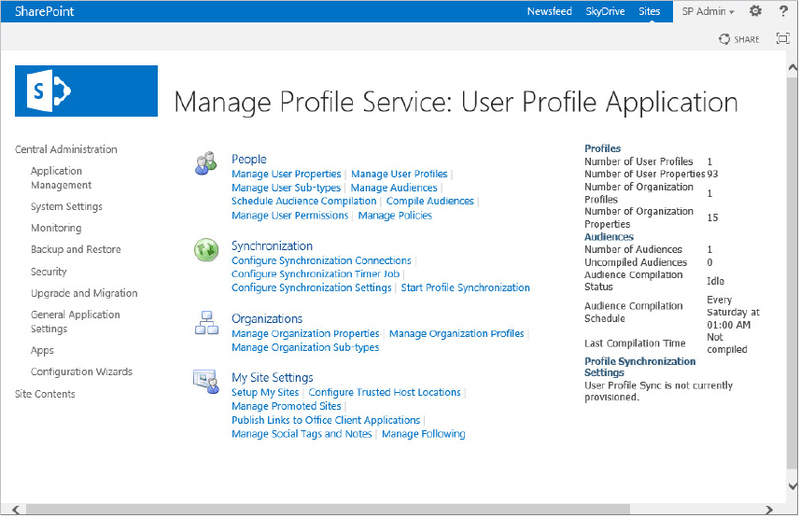 The User Profile service in SharePoint 2013 is a shared service just as it was in SharePoint 2010, and it enables administrators to create and edit user profiles. In Chapter 3, “Installing and Configuring SharePoint 2013,” you learned how to provision the User Profile Service Application (UPSA) and configure your My Site host web application and site collection. To navigate to the UPSA web page in Central Administration, click the Manage Service Applications link on the homepage, and then click the User Profile Service Application link in the list of installed service applications. Figure 1 shows the User Profile Service Application home page. For those familiar with the SharePoint 2010 version, you will see that there aren’t many differences between the SharePoint 2010 UPSA and the SharePoint 2013 UPSA. The following sections discuss key aspects of the People and Synchronization settings of user profiles. SharePoint 2013 relies on user profiles to a much greater extent than SharePoint 2010. Because the user profile information represents a collection of properties or attributes of the user, My Sites, search, Azure Workflow, and the new server-to-server authentication all rely on user profiles. In order for this information to be available, the user profile data must be imported into SharePoint. Synchronization, or syncing, is the process that SharePoint uses to import user profile data from other data sources, such as Active Directory, LDAP, or by using Business Connectivity Services (BCS) to pull data from line-of-business applications. In addition to syncing user profiles, you can also sync groups. As mentioned earlier, there are now two Central Administration options for profile synchronization in SharePoint 2013: SharePoint Profile Synchronization using FIM, and the new Active Directory Import method. SharePoint Profile Synchronization Full-featured option using FIM. This option allows two-way synchronization, and the use of BCS to augment property import. This approach is more difficult to set up and slower than Active Directory Import. Active Directory Import This approach is easy to set up and very fast compared to other options. Only one-way Active Directory import is supported, and you can use LDAP filters for users and groups. This approach allows one connection per domain, and custom property mapping for simple data types. Mapping to SharePoint system properties and BCS import is not supported. External Identity Manager This approach disables profile synchronization features from SharePoint. You must use a custom solution that utilizes the SharePoint API to create user profiles. 1. 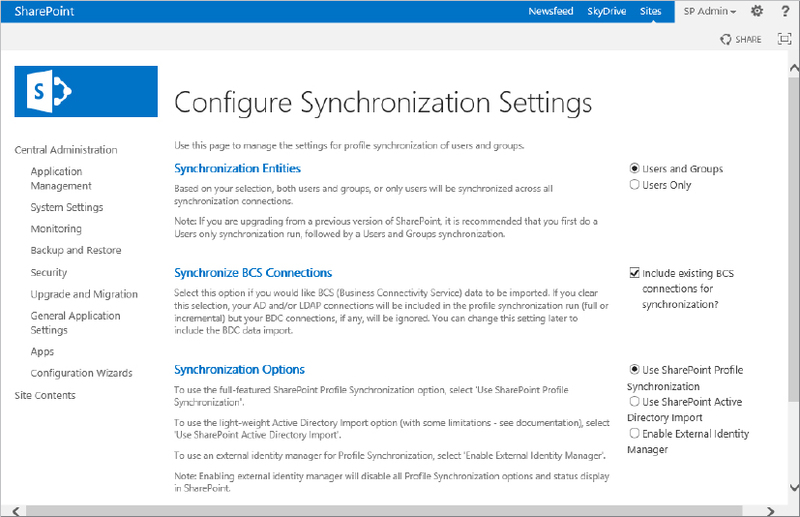 In the Synchronization section of the Manage Profile Service page, click Configure Synchronization Settings. 2. On the Configure Synchronization Settings page, shown in Figure 2, select the option to synchronize Users and Groups or Users Only. 3. If you chose SharePoint Profile Synchronization and want to include BCS connections in the process, check the appropriate box. 4. Choose the Synchronization Option that you want to use and then click OK. This completes the synchronization type selection process. - Sharepoint 2013 : Configuring User Profiles and Social Computing - What’s New in Enterprise Social? - About Microsoft SharePoint 2013 : What Is a Workflow? - About Microsoft SharePoint 2013 : What Is Tagging? - About Microsoft SharePoint 2013 : What Is a Content Type? - About Microsoft SharePoint 2013 : What Are Web Parts? - About Microsoft SharePoint 2013 : What Is a View?